If you’re ready to leave the distressing real world of Brexit and Trump-mania behind, then join me in this bizarre alternate comedy universe where everything is hunky-doodle, concocted by a madman from the Bonzo Dog Doo-Dah Band in the early ’70s. There’s actually three releases here – an EP and two LPs – packed onto two CDs so you’re certainly getting some bang for your buck. This continues for about three minutes with a couple of bridges, but I’m already hooked. It’s here where we first get a taste of what Spear is all about, comical songs that skewer pop music and celebrate it simultaneously. His experimental music also pushes the boundaries of the studio, filling the multi-track tapes with all sorts of sounds and contraptions. Maybe the effects are a little dated now, but the comedic effect remains. It’s rather like a musical Monty Python… although the Pythons were musical… let me think on that! The first LP, Electric Shocks shows a blend of original material and cover versions, showing Spear’s versatility. Much of Spear’s work references music that was then over forty years old; disturbingly, that’s a lot like what I’m doing now. For example, All by Yourself in the Moonlight was originally written in 1929, and Make Yourself a Happiness Pie came only a year later. In true Spear format, the first of these songs is completely given a rock makeover, extended ad nauseum with increasingly silly sound effects. An interesting prog link was made here, as I found one of the sound effects elsewhere on the Italian band Cherry Five’s debut from 1975. On Electric Shocks, Spear manages to rustle up a superb cast of musicians, from founding Yes guitarist Peter Banks on Doctor Rock to the entire American group The Flamin’ Groovies on Mattress Man. This means that the music is actually very well played, although don’t expect too much in the way of prog and odd time signatures here. Rather, expect more vaudeville and blues. The music only seems to get more complex on Unusual, the less-loved but more professional sounding LP by Spear. Covers like I Love to Bumpity Bump (On a Bumpy Road with You) and When Yuba Plays the Rumba on a Tuba Down in Cuba – once again, both originally recorded at the turn of the 1930s – must have taken quite a bit of practice, speedily paced as they are for comedic effect. The choice of covers gets weirder here though, with the classic Pinball Wizard starting off the set. Unfortunately, it seems that Spear’s only idea for this song was to record it in an odd high pitched voice, which only detracts from the piece. It does make me want to get out my copy of Tommy though. 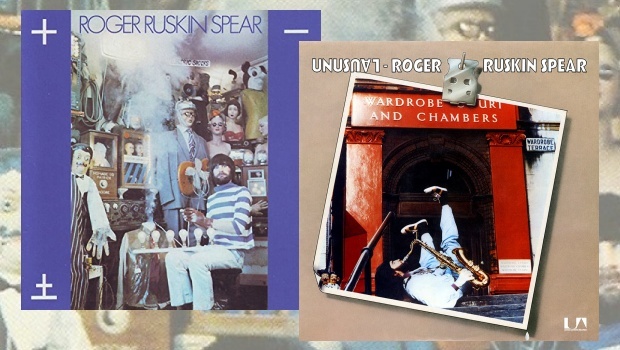 In a time when progressive artists were taking music just about as seriously as you could, Roger Ruskin Spear was going the opposite direction, and yet still producing quality material that still sounds just as ‘unusual’ today. Esoteric have done a great job with these reissues. All the artwork and original liner notes have been included in some form or another, and Malcolm Dome’s essays complement the set nicely. Here’s wishing Spear had made a few more albums for me to review! Too many to name, but Roger Ruskin Spear comes through in spades!